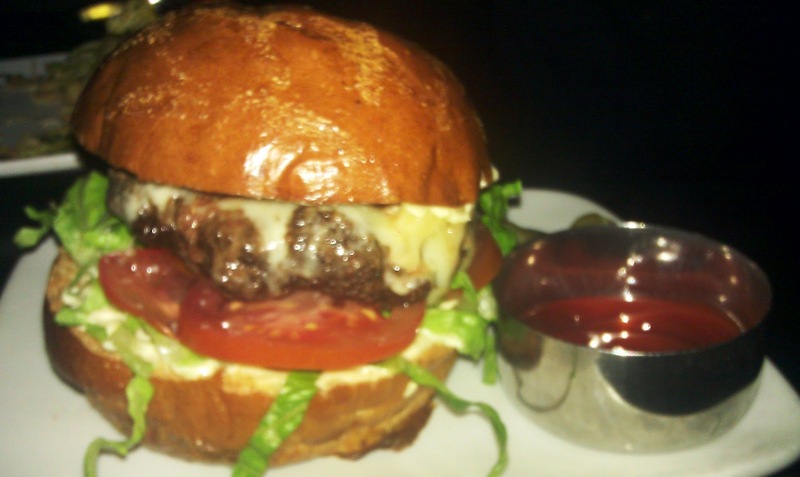 I noticed that LAist had rated the burger at Susan Feniger's STREET as one of the best in LA. I had just tried another restaurant guided by Chef Feniger's hand, Border Grill in Santa Monica. Chef Feniger achieved some notoriety on Top Chef, and has established herself in LA with both Border Grill and Cuidad. The food at Border Grill was fantastic, and I had similar hopes for STREET. Note: if you want to go to STREET, make reservations well in advance. I called 5 days in advance, and I could only wrangle an 8:30 PM seating. Upon arrival, I noted a collection of hungry patrons waiting to be seated, and this crowd spilled out onto the sidewalk, as well. STREET was certainly not wanting for customers. My party was seated as quickly as possible by an attentive staff on a jammed night. The Beef: This was a shockingly good Chuck. It was a lean, 100% Angus, wet-aged beef, which was surprisingly juicy, bloody, and beefy. Street did something with the humble Chuck, which elevated it to the level of a blend of premium cuts of beef. The funk of the aging really popped, and this was wet-aged beef, which is a less expensive process, and it generally results in a less flavorful product. There was a little more connective tissue than I cared for, but the wonderful flavors of the beef more than made up for that minor nit. The Seasoning: We had two burgers--one was light on the seasoning with just a hint of pepper and dash of salt. The other was far heavier on the pepper, so that this spice lingered on the tongue throughout the entire bite. The evenness of the seasoning was notable. It appeared that they micro-ground their spices to achieve such an even distribution. I do this at home with a mortar and pestle, and it makes a huge difference. The seasoning was a positive note. Chef Feniger insisted that we try one of the cheeseburgers her way, and she personally delivered it. This one one came with the yuzu/kosho mayo and veggies as part of the assemblage. The tricked out mayo was good, but it introduced a fruitiness to the dish, which I found discordant with the otherwise perfectly balanced flavors in the dish. The extra sauce and vegetation made the burger far wetter than I would have liked. Still, that glorious beef carried the dish and made its presence known throughout the bite. 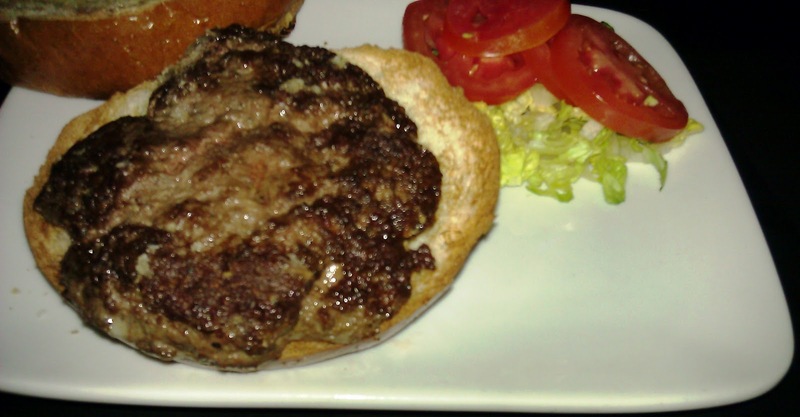 The mayo did serve to temper the chewiness of the burger, but only a little. Aside from a little tomato, I don't appreciate fruits on my burgers. I think that yuzu spread would have been fantastic on a crispy chicken sandwich. The Sear: HELL YEAH! They nailed the sear. It was crisp, savory, and very satisfying. 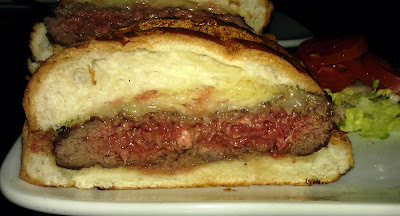 The sear provided a really nice counterpoint to the warm but very rare center of the burger patty. The sear was replicated on both burgers...kudos to the kitchen at STREET for getting that right on such a busy night. The Preparation: The beef came pre-ground (medium coarse) from the supplier, and something went wrong either on the supplier's end or during the prep process. Unfortunately, in spite of perfect flavors, cooking temperature, and sear, the burgers came out a little rubbery. This was likely due to a combination of leanness and over-manipulation of the beef during the seasoning and patty forming process. The chewiness was bit of a distraction, because it collided with an otherwise delightful cheeseburger. When this was brought to Chef Feniger's attention, she made a note to address this with the prep staff. I don't imagine that this will be an issue in the future.The hefty, thick patties were perfectly seared on a wickedly hot griddle. The Cheese: This was an Aged White Vermont Cheddar, and by itself it was quite nice. 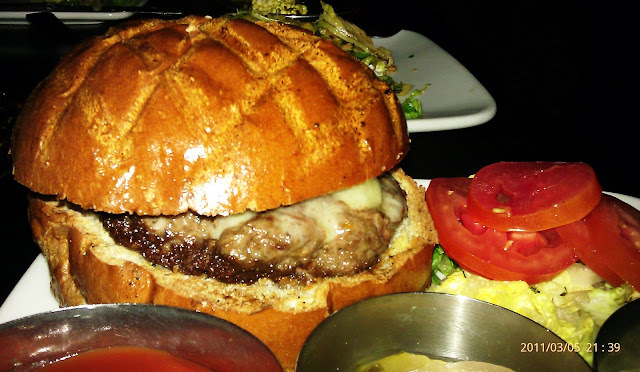 However, that poor Cheddar never stood a chance against the powerful beefiness and funk of the burger meat. The cheese went unnoticed. Frankly, the cheese was not needed. The beef and seasoning carried the dish without needing to draw savory and umami notes from the cheese. The Bun: This was a really solid brioche from Ca'd'Oro Bakery in Santa Monica. The bun was lightly toasted on the griddle. The interior of the bun was flaky an light enough to resemble a croissant, while the crust was resilient enough to provide toothsomeness and a barrier against the copious juices flowing from the burger. The bun was quite neutral, and this was fine since this dish was carried by the beef, and all of the other ingredients were along for the ride. The Meat To Bun Ration: Dead on! Sides: The house-made pickles were subtle and just right. The tomatoes and lettuce were perfectly fresh, which indicated a tremendous amount of care was taken at Street...when a restaurant is careful with their selection of produce, then this bodes well for the kitchen's output. Wolfgang's Steakhouse was careful and meticulous, and Comme Ça was not. Wolfgang's Steakhouse was fantastic and Comme Ça....not so much. While the dish did not come with fries, they were not missed. The Shrimp Stuffed Shitake Mushrooms really hit the spot as an appetizer, and the fries were not notable in their absence. The Value: It was 12 buck Chuck, but damn...it was totally worth it. I have never experienced Chuck elevated to this level of complexity and fullness of flavor. STREET delivered a nearly perfect burger. The sole shortcoming was that the texture was too chewy. This threw an otherwise fantastic burger out of balance. I predict that once this issue is cleared up, this will become one of our "go-to" burgers in LA. The staff was on top of their game, too. Burger Review : STREET delivered a perfect burger in terms of flavor. Chef Feniger and crew performed a near miracle with a humble cut of beef. Go there, and go there SOON. Get the mayo on the side, and use it as a dipping sauce. Rating...4 Bites This would have been a 5 Bites rating had it not been for the chewiness of the beef.